Hi screening colleagues. My name is Pritpal Rayat and I am the Statistical Section Head of the Screening and Immunisations team at the Health and Social Care Information Centre (HSCIC). My team sits within the Population Health branch of the Information and Analytics Directorate. As national cervical screening programme manager Ruth Stubbs mentioned in her blog on Tuesday, I am taking this opportunity to make you aware of our recently published annual report ‘Cervical Screening Programme, England, Statistics for 2014-15’ for which I am the responsible statistician. This report includes key statistics on the call and recall programme for women aged 25 to 64 years, as well as statistics on screening samples examined by pathology laboratories and on referrals to colposcopy clinics. One of the key uses of this annual report is to inform policy and to monitor the quality and effectiveness of screening services. Cervical screening is intended to detect abnormalities within the cervix that could, if undetected and untreated, develop into cervical cancer. Latest figures from the report ‘Cervical Screening Programme, England, Statistics for 2014-15’ are detailed below and compared to previous years. 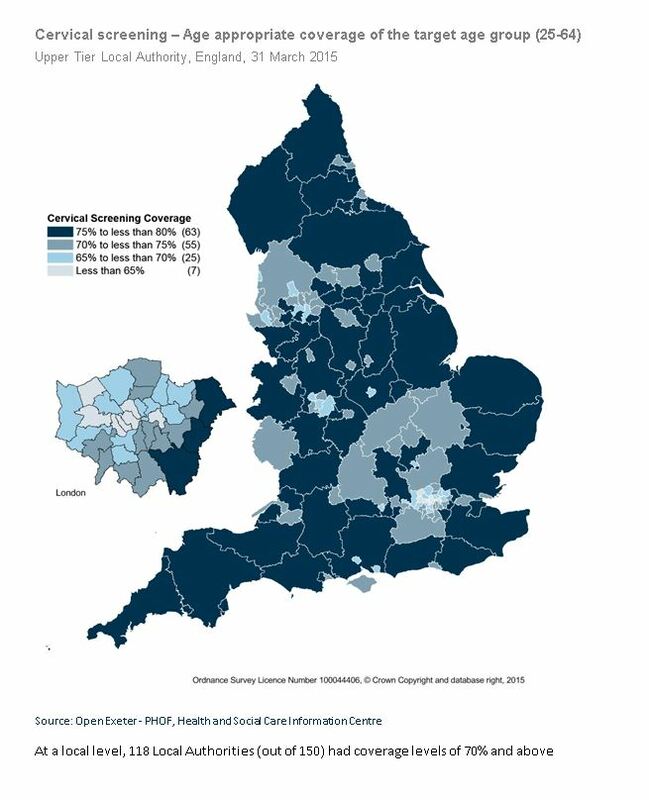 At a local level, 118 Local Authorities (out of 150) had coverage levels of 70% and above (see coverage map below). A total of 4.31 million women aged 25 to 64 were invited for screening in England in 2014-15 and 3.12 million women were tested, representing a fall of 3.3% from 2013-14. Of those aged 25 - 64 tested in the year, 81.9% were tested following an invitation from the screening programme - the remaining 18.1% had screening tests not prompted by the programme. 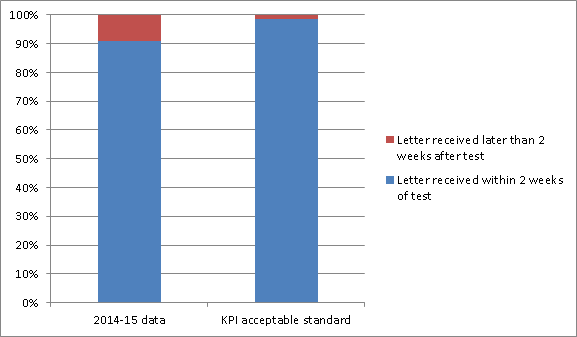 91.0% of letters sent to women tested were reported to have an expected delivery date of within 2 weeks of the sample being taken – this is below the key performance indicator (KPI) acceptable standard of 98.5% (see column chart below). Of the samples examined in 2014-15, 94.8% were submitted by GPs and NHS Community Clinics, of which 2.5% were inadequate - compared with 2.4% in 2013-14. In 2014-15, a total of 198,216 referrals to colposcopy were reported in England - this represents a slight fall of 0.6% from 2013-14 (199,322 referrals). On a final note, our latest report ‘Cervical Screening Programme, England, Statistics for 2014-15’ highlights a fall in cervical screening coverage for both younger and older women. This will be of concern to health professionals and organisations with a focus on cervical cancer. I hope this report will be useful to them in planning their future work in this important area.